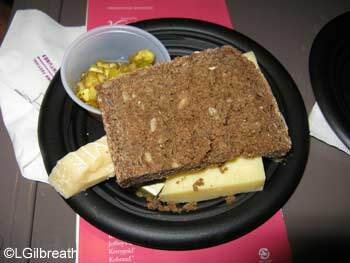 At the 2009 Epcot International Food and Wine Festival Cork, Ireland featured this on their menu. It's delicious with Kerrygold Dubliner cheese! Combine the flours, 1/2 cup oatmeal, bran, baking soda, salt and sugar in a large mixing bowl. Stir until well blended. Combine the canola oil and buttermilk in a small bowl. Make a well in the center of the dry ingredients and stir in the liquid with a wooden spoon. Continue stirring until a soft dough forms. Spoon batter into prepared pan, and with the back of a spoon make a 1/2" long well in the center of the batter. Sprinkle remaining tbsp of oatmeal down the center. Bake 50 to 55 minutes, or until a skewer inserted into the center comes out clean. Remove from the oven and cool on a wire rack int he pan for 10 to 15 minutes.